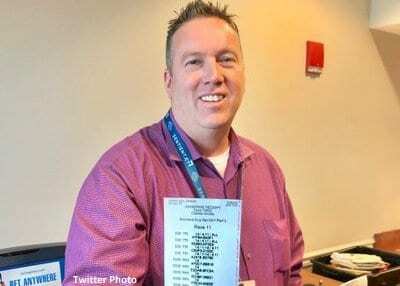 Chuck Grubbs of Georgetown, Kentucky, cashed more than $87,000 in winning wagers on the Breeders' Cup Classic, jumping from 31st place to the top of the leaderboard to win the 2018 Breeders' Cup Betting Challenge (BCBC) at last weekend's Breeders' Cup World Championships. The 10th Breeders' Cup Betting Challenge, Thoroughbred racing's biggest live money tournament, was held November 2-3 at Churchill Downs and from official satellite locations at Gulfstream Park in Hallandale Beach, Florida, Monmouth Park in Oceanport, New Jersey and Santa Anita Park in Arcadia, California, and online at participating ADW sites. · The Breeders' Cup Betting Challenge on track handle at Churchill Downs was $2,487,670 or 12.52% of on track handle during Breeders' Cup weekend. This year's BCBC awarded 15 automatic berths into the 2019 National Horseplayers Championship, February 8-10, in Las Vegas. This entry was posted in Horseplayers and tagged Breeders' Cup, breeders' cup betting challenge, breeders' cup classic, chuck grubbs, churchill downs, handicappers, horseplayers by Press Release. Bookmark the permalink.